Virginia Moxley, former dean and professor emeritus of the College of Human Ecology, was awarded the 2018 Lifetime Achievement Award from the Association of Public and Land-grant Universities (APLU). The Lifetime Achievement Award honors a nationally-recognized leader who has a significant history of promoting and advancing the human sciences in higher education. Moxley began her higher education administrative career in 1973 as a department head at Emporia State University. 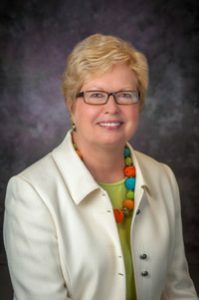 She was appointed associate dean of the college of human ecology at Kansas State University in 1985, a position she held for over two decades. Moxley became dean of the college of human ecology in 2006 and served until her retirement from academic administration in 2013. Moxley's scholarship and much of her leadership focused on creating models, policies, and strategies for higher education alliances. She helped to found the Great Plains Interactive Distance Education Alliance (Great Plains IDEA) which, since its inception in 1994, has grown to a nation-wide alliance sponsoring multi-institutional undergraduate and graduate academic programs. Moxley chaired both the Board of Directors and the Cabinet, was principal author of the policies for the alliance, served as principal investigator for multiple funded projects to develop the alliance and its programs, and oversaw the management of the alliance. The model for multi-institutional academic programs designed by the Great Plains IDEA collaborators has been widely replicated. She has served as national president of Omicron Nu Honor Society (now Kappa Omicron Nu) and collaborated in the development of a human sciences program at the National University of Paraguay. In her role as chairman of the BoHS Academic Committee, she led a team of representatives from six professional associations and two federal agencies to implement the redefinition of fields of study within the human sciences for the 2000 Classification of Instructional Programs by the National Center for Educational Statistics—the first update in four decades. For her contributions to the human sciences, Moxley has received the Board on Human Sciences Public Service Award in 2009 and the American Association of Family and Consumer Sciences Distinguished Service Award in 2014. For her contributions to distance education, she has received national awards from the Association of Continuing and Higher Education, the University Continuing Education Association, and the National University Telecommunications Network. For her contributions to the wellbeing of Kansans, Moxley was named a Fellow of the Kansas Health Foundation in 2003. Moxley played a key role on federal human sciences advisory boards throughout her career. She was also an early and outspoken proponent of alternative learning models such as distance learning as a means to extend educational opportunities to students who wouldn’t typically have access to college. She also played a central role in the creation and leadership of a learning consortium helping institutions of higher education as they work to expand and improve distance learning. Throughout her career, Moxley has been a dedicated mentor of rising leaders in the field while serving on a variety of APLU’s Board of Human Sciences committees. For more information on the Lifetime Achievement Award and the APLU, visit www.aplu.org. This article was posted on Monday, October 15, 2018, and is filed under College News, Great Plains IDEA.